Head coach Bob Dallis said that this year’s team has 10 strong players, providing the team with strong depth and the ability to play a variety of people. Dallis added that lone senior Allison Chuang ’19 has stepped up as a leader for the team this year. “[Chuang is] someone who’s just a really caring person and also a really good player and great contributor,” Dallis said. Both Chuyang Guan ’20 and Paripovic spoke about a great bond between team members that contributes to their success. This kind of team support has been a constant for the Big Green. 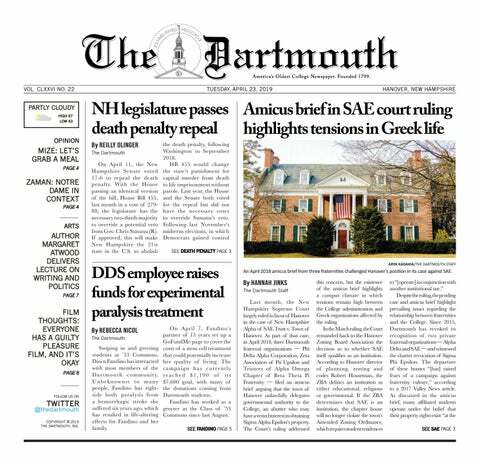 Guan remarked that this was something she noticed as a recruit compared to other schools she visited, and it proved a motivating factor in her decision to come to Dartmouth. Guan emphasized the impact of injuries toward the end of the season leading to just her and Paripovic being able to compete on the final day of the fall’s Big Green Invitational. She said the team is coming into the winter with the intention of optimizing their performances by taking the best care of themselves. The team also used the fall season to experiment with the lineup and find the best position for each player. “Within the next few weeks, we’ll start solidifying the lineup so people can get used to playing at their position,” Paripovic said. The Big Green will move on to the important Eastern Conference Athletic Conference Indoor Championship next weekend in New Haven, Connecticut. Away matches against Marquette University and Michigan State University and a Mar. 2 home match against the University of Massachusetts Amherst will round out the winter season. The Big Green then travels to Texas during spring break to compete against Rice University, Texas Christian University and Southern Methodist University, and begins Ivy League play Mar. 30 against Harvard University.